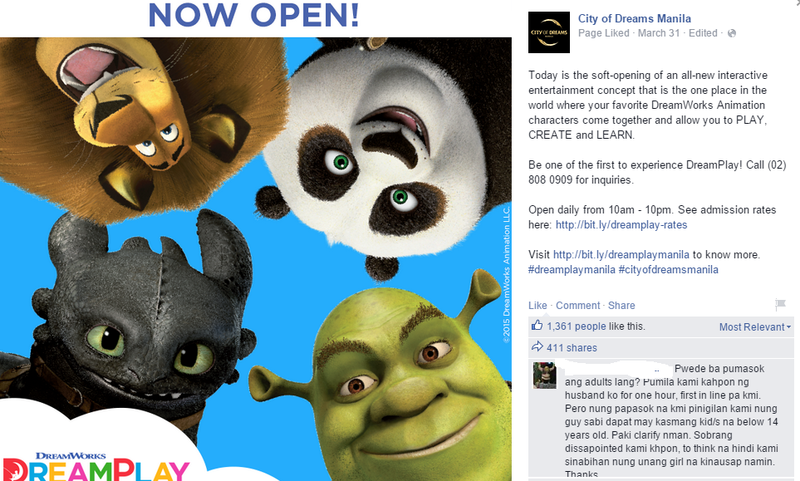 When I saw this announced in City of Dream Manila's Facebook page, I knew it was the best time to visit. It came in perfect timing because we went off from work early. We had the entire afternoon to experience Dream Play and explore City of Dreams. Upon learning that the park is only on soft-opening, I decided to call in advance. I wanted to verify restrictions or other related policies. I was later given the assurance that the park is open to the general public. I don't need to be a hotel guest or secure invites. We arrived around past 2 pm and joined the other excited guests for the tickets. When we reached the Cashier, WE WERE PREVENTED TO PURCHASE TICKETS. When we asked why, the lady attendant told us that we need to have kid companions or "invited guest access". This was when the disappointment started to happen. I asked the reason behind the policy, but the lady attendant cannot provide even a half decent explanation. The waiting area for the tickets was getting crowded so out of courtesy to other guests, we moved out. More than the disappointment, I felt cheated after the incident. I called in advance to verify admission policies. I made all means to ensure that we can avail everything. I wasn't contented with the unfair treatment we received so I called the same customer service number to report my experience. I decided to call instead of speaking to the park's supervisor because DreamPlay doesn't have an information counter or help desk. I will end up talking to the same useless lady attendant. 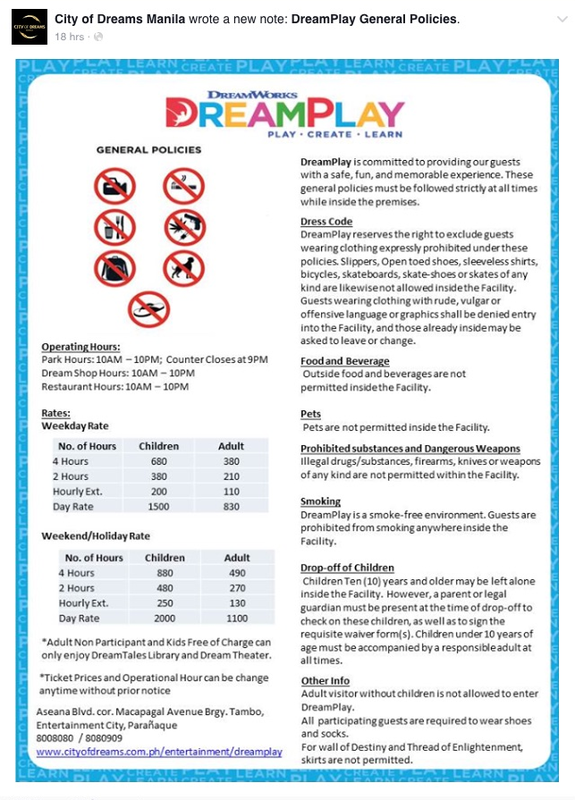 Much to my surprise, the information officer who attended my call is likewise not aware of DreamPlay's restrictions. My call was placed on hold twice to verify the park's policies. Adding up to my agitation, I was told to expect a call from DreamPlay within the day to verify my query. At this point, we decided to explore City of Dreams' facilities while waiting for the much needed response. I never received the promised return call from DreamPlay's management. I called the customer service again and landed on the same information officer. She was surprised that no one from DreamPlay bothered to attend to my request or that "promised return call." I decided to make my last move. I went to DreamPlay again and explained my situation. I told one of the employees that there was no advice about their restrictions and policies. I showed them the announcement on City of Dreams' Facebook Page and their web page. There was no clear statement about the park's requirement of having an invited guest access and the need to have kid companions aged 14 years old and below. The lone and singular response I consistently received was, policy po kasi mam. Alright, not a single trace of apology from all the hassles I've experienced. On the way home, I checked City of Dreams' Facebook page again and there was one courageous person who blurted my sentiments. Perhaps the management of Dream Play was flooded with the same complaint. 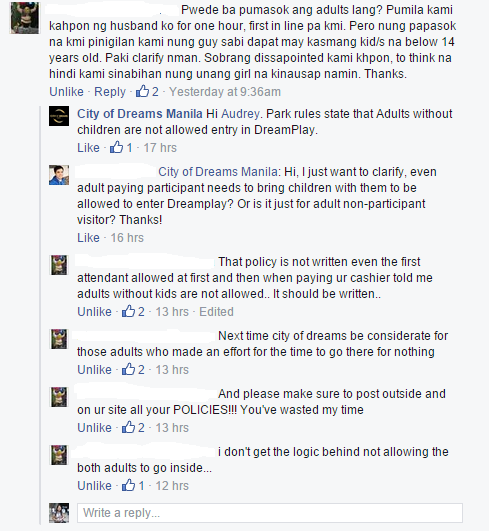 So finally at 6:55 pm yesterday, someone finally had the brains and senses to post the park policies to City of Dreams' Facebook page. Heck, simple task that could have spared us from all the agitations. My time, effort, energy, useless phone calls and a bonus headache on the way home. For someone who is in the profession of policy making and process review, I still see some loopholes here. Even the presentation I should say... is a bit disorganized. And for once, the management might want to clarify the adult to children ratio to be granted access. For parents who will bring their children, please brace yourselves for the waiver form. Yes, Dream Play might not be liable for injuries that will happen within their premises. I've been to Disneyland and Universal Studios and sadly, this is my first time to observe this practice. And before I forget, this should have been part of their so-called General Policies. As far as I know, General Policies are those that apply to all guests. Since DreamPlay requires guests to have kid companions, I believe this should be included. 1. Presence of written policy - This could have been prevented if it was mentioned in your webpage and that announcement posted on City of Dreams' Facebook page. 2. Absence of coordination - Obviously, even the employees from City of Dreams are not aware of your policies. 3. Basic Customer Service Skill : Apologize - Even the moderator of the Facebook page did not manifest intentions to utter the much needed apologies. A sincere apology could have changed the story of this blog post and the sentiments of other disappointed customers. Thank you Dream Play for all the hassles. Anong kalokohan yan? E pano kung wala ka talagang batang pwede maisama pero gusto mo maexperience at magfeeling bata? Eto na naman sasabihin ko eh.. onli in da pilipins.. hayyy.. I hate to say this pero talagang everywhere you go standout ang mga useless 'policies' nating mga pinoy. Exactly my point... d ko talaga gets!!! !